Whisk the tikka paste, coconut milk and lime juice together in a bowl. Chop the chicken into large chunks, approximately 3-4cm pieces. Add to the bowl of marinade and toss well to coat. Cover and place in the fridge overnight. To cook, preheat the oven to 180°C. Thread the chicken onto the 4 (drained) skewers, including two onion wedges on each. 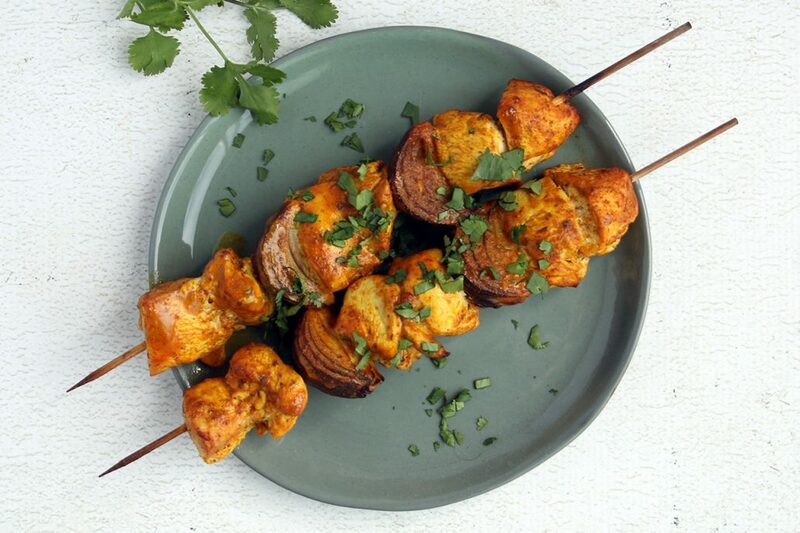 Place onto a roasting tray and use a silicon pastry brush to cover the skewers (particularly the onion wedges) with any leftover marinade from the bowl. Bake in the oven for 18-20 minutes, turning and brushing the kebabs halfway through with the juices + marinade run-off from the tray itself. 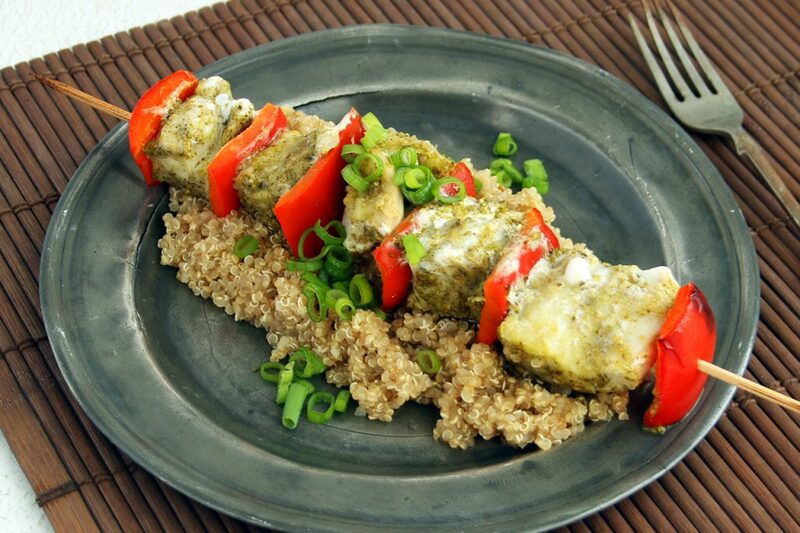 Serve the kebabs with finely chopped coriander – and enjoy with your choice of side dish. Bring a small pan of salted water to the boil. Add the mange tout and baby corn and cook for 2-3 minutes before draining well and setting aside. Add the carrot, beansprouts, ginger puree, fish sauce, ketchup and dark soy sauce to the pan and combine well as the mixture cooks through for approximately 1-2 minutes. 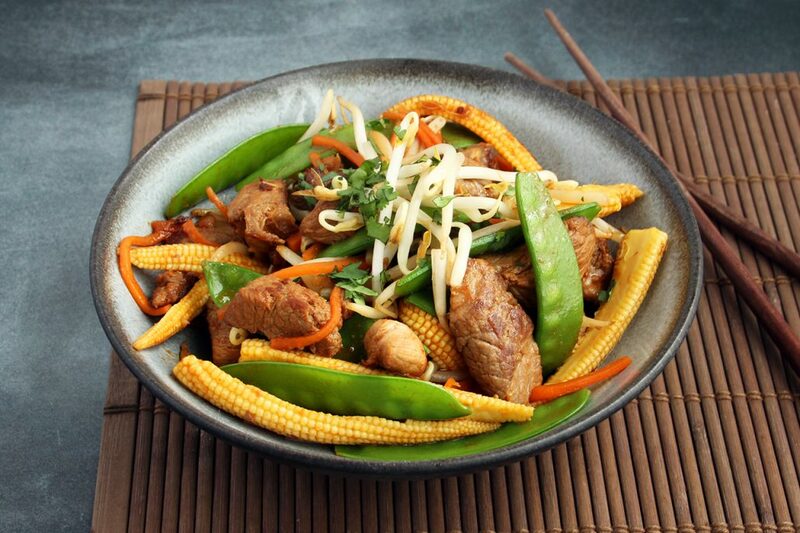 Add the mange tout and baby corn to the pan in the last minute and combine well as it all warms through. Divide the stir-fry between two warm bowls and scatter over any left-over, rinsed beansprouts and finely chopped coriander to finish. 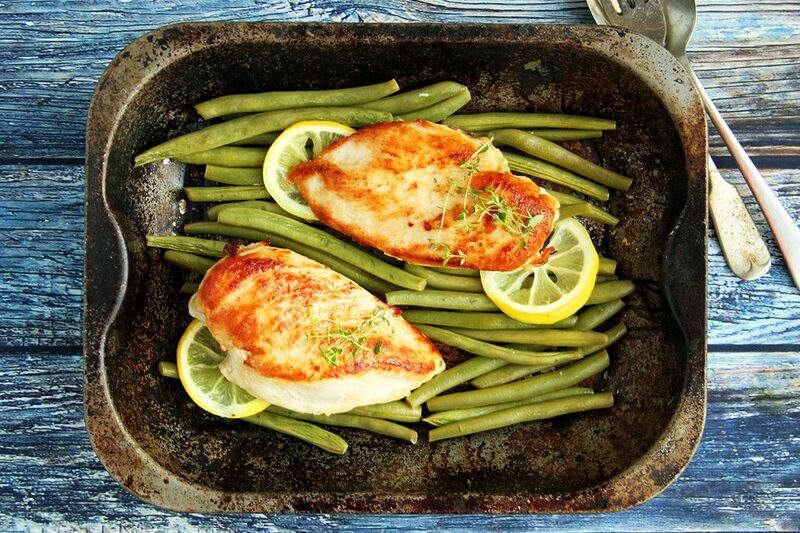 Heat the olive oil in a pan and fry the chicken breasts until golden on the outside. Season with salt and set aside. Spread the green beans out in a small roasting tray and cover with the hot stock. Halve the lemon and squeeze over the juice of on half (catch the pips!). Slice the remaining lemon half into slices and place the few slices over the green beans. Add the chicken to the dish and nestle down between the green beans allowing the stock to come up about halfway up the chicken. 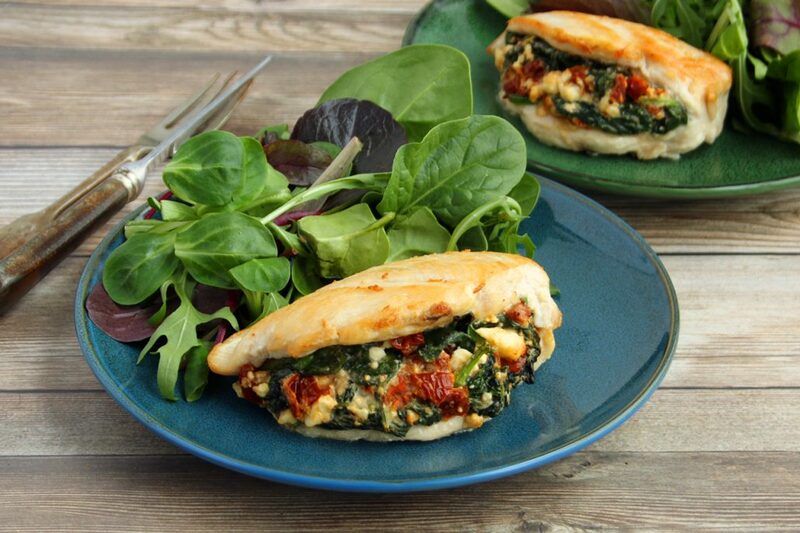 Bake in the oven for 20-25 minutes, or until the chicken has cooked through and the green beans are cooked – but still retain a reasonable ‘bite’. Drain off the chicken stock and scatter over the fresh thyme leaves over the chicken before serving. 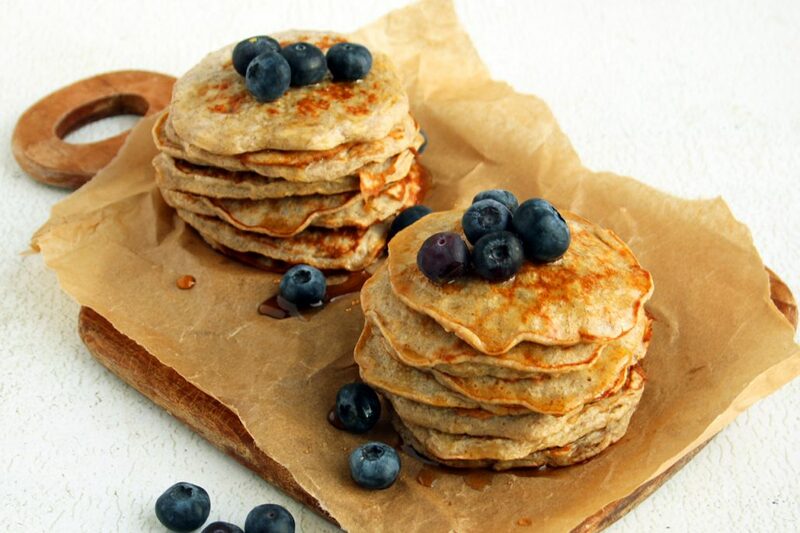 Have some weekend fun by whipping up a batch of gluten-free Banana mini pancakes. If you aren’t up for making a large batch like this, simply halve the recipe below. Macros are calculated on a serving being 4 mini pancakes so there will be enough for 3 people with some leftover. Serve drizzled with honey or maple syrup and enjoy with fruit (however, macros exclude any of the garnishes). Chop the bananas, then place them into a bowl and use the back of a fork to mash them to a smooth puree. Crack in 4 eggs and whisk well to combine. Add the baking powder and cinnamon (best added by sprinkling over through a tea strainer). Whisk until there are no lumps and the baking powder and cinnamon have been mixed in thoroughly. Pour 3 tablespoons light olive oil into a little bowl and have a ball of kitchen paper handy. Dip the kitchen paper into the oil and wipe the pan with it. Place the pan over low-moderate heat. NOTE: You may be able to make two pancakes in the pan at the same time, but they may not hold their round shape as well. Also, these pancakes are not suitable for large sizes, as the ‘batter’ is very delicate. However, they are perfect for mini ones. These ones were approximately 10cm diameter. 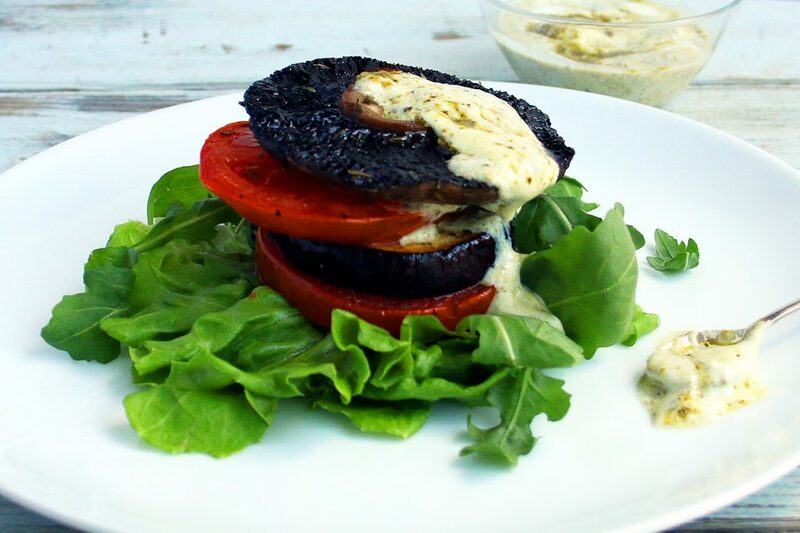 A fast, simple, posh vegetable stack that the vegetarians will love! Just be sure to source the vegetarian pesto which uses an alternative to Parmesan. Alternatively, stir harissa paste into the yogurt to make an equally delicious light meal / lunch! Salt the sliced aubergines and place in a colander for 20 minutes. Pat dry and place on a large roasting tray along with the mushrooms and sliced tomato. Scatter over the dried thyme over the drizzle the olive oil evenly over. Bake for 20 minutes, ensuring the aubergines are cooked through. In the meantime, make the dressing by simply combining the pesto with the yogurt. To serve, generously season the grilled vegetables and assemble into a ‘stack’ over lettuce and rocket. Drizzle over the pesto dressing. Tip the mince into a bowl. Add the ground cinnamon and ground cumin and season the mixture with salt. Combine well and form into small meatballs, approximately 35g each. (You should yield between 13-15 meatballs.) Set aside. 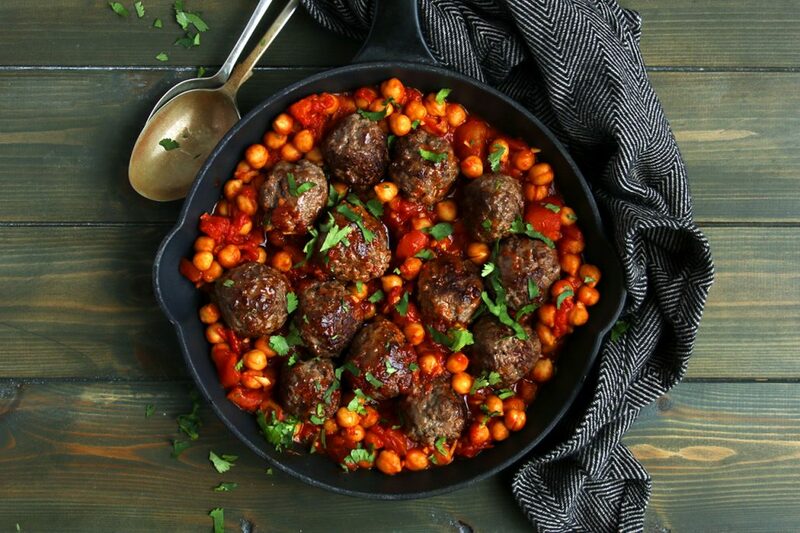 Heat the olive oil in a large pan (its best to work in two batches so as not to over-crowd the pan) and brown the meatballs until golden and caramelised on the outside. Remove with a slotted spoon and set aside. Add the drained chickpeas and cayenne pepper to the same pan, along with the chopped tomatoes and beef stock. Add the additional pinch ground cinnamon and the ground coriander. Cook over high heat until the mixture thickens and reduces, approximately 10-12 minutes. Crack over a generous amount of black pepper and serve garnished with chopped coriander. Season the chicken breasts with salt and make superficial incisions into the top side of each one. 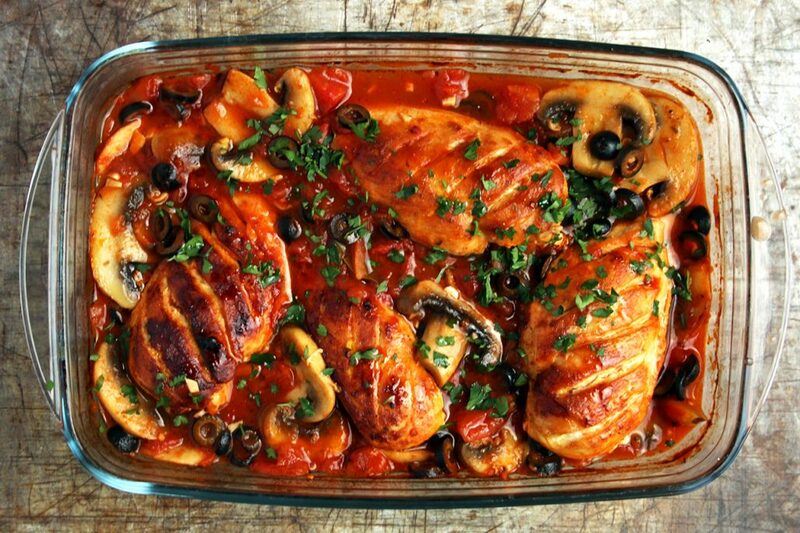 Heat one tablespoon olive oil in a large pan on the stove top and brown the chicken breasts (sliced-side down) until golden and caramelised. Flip each one over and brown the underside for a minute. Remove and place into a large, greased casserole or roasting dish. Set aside. Wipe the pan clean and add the second tablespoon olive oil. Cook the mushrooms over high heat for 3-4 minutes until they partially caramelise, adding the garlic in the last minute. Stir continuously to prevent the garlic burning. Add the white wine to deglaze the pan and cook until the wine cooks out and has completely evaporated. Tip the chopped tomatoes into the pan. Add the bay leaf and dried oregano. Cook over moderate heat for 10 minutes so that the mixture reduces and thickens slightly. Serve with a generous crack of black pepper and garnish with chopped parsley. 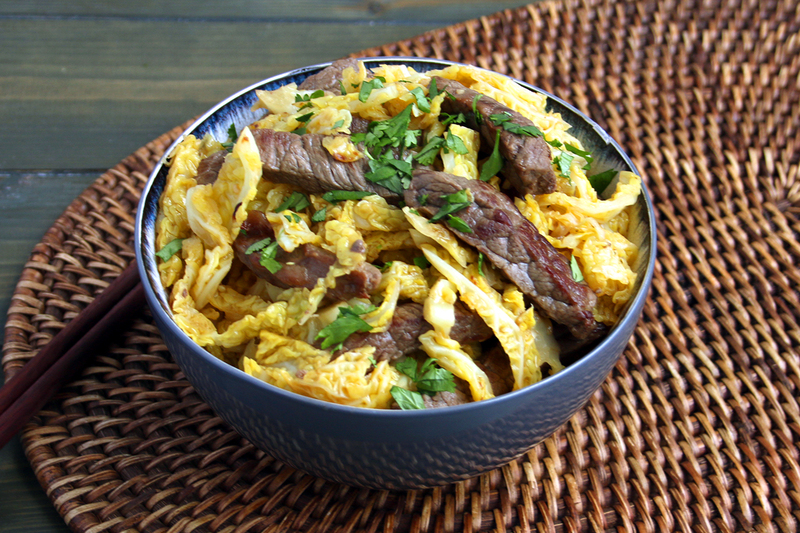 A super-simple low-carb lunch or dinner option. We jam-packed this beef and Savoy cabbage dish with glorious Savoy cabbage to get that all-important fibre. The roasted sesame oil drizzled over at the end is the key to bring it all together. Add the remaining half tablespoon olive oil to the same pan and add the cabbage, garlic and ginger. Toss well to coat the cabbage evenly in the mixture and cook for 2-3 minutes, stirring continuously. Add the beef stock and increase the heat to high. Cook uncovered, stirring occasionally until all the stock cooks down and evaporates. Stir in the rice wine vinegar and soy sauce and return the beef strips (as well as any resting juices) to the pan. Mix well to combine and allow the beef strips to gently heat through. Drizzle the sesame oil over the mixture, combine well and divide between two warm bowls. Garnish with chopped coriander.